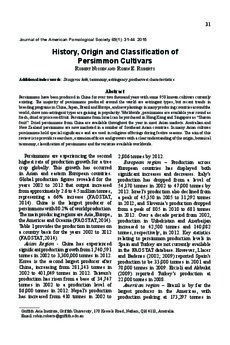 Persimmons have been produced in China for over two thousand years with some 950 known cultivars currently existing. The majority of persimmons produced around the world are astringent types, but recent trends in breeding programs in China, Japan, Brazil and Europe, and new plantings in many producing countries around the world, show non-astringent types are gaining in popularity. Worldwide, persimmons are available year round as fresh, dried or processed fruit. Persimmons from Israel can be purchased in Hong Kong and Singapore as "Sharon fruit". Dried persimmons from China are available throughout the year in most Asian markets. Australian and New Zealand persimmons are now marketed in a number of Southeast Asian countries. In many Asian cultures persimmons hold special significance and are used in religious offerings during festive seasons. The aim of this review is to provide researchers, extension officers and growers with a clear understanding of the origin, botanical taxonomy, classification of persimmons and the varieties available worldwide.